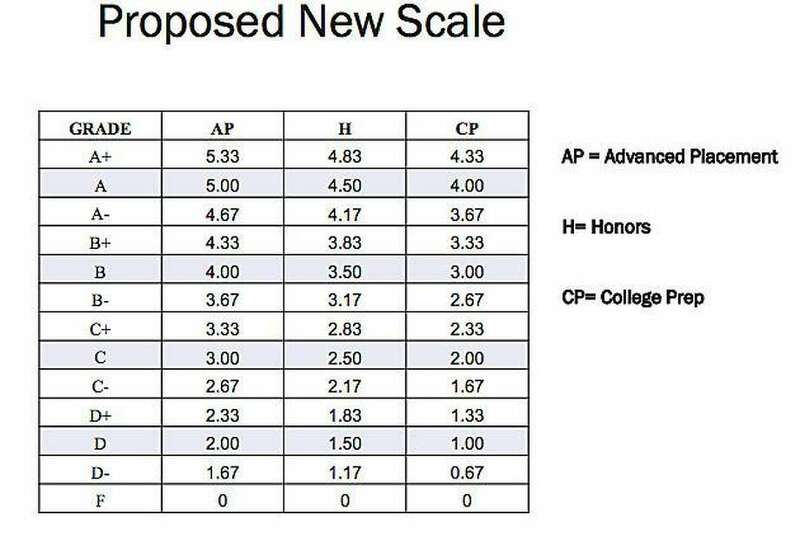 The proposed new scale for grades splits courses into: Advanced Placement, Honors and College Prep. FAIRFIELD — Sstudents at Warde and Ludlowe High Schools can currently obtain a 5.0 grade point average if they get a 97 percent or above in Advanced Placement courses. With proposed weight changes to grading and redistribution of high school courses for the next school year, that same student could obtain a 5.33 GPA. Hatzis and Warde Headmaster David Ebling, in a presentation to the board on Jan. 8, said the grade-weighting proposal stemmed from earlier attempts to clarify course names and put Fairfield high schools on a similar grading scheme as other schools in the county. Currently, there are four categories of classes: Advanced Placement, Level 1, Level 0 and Level 2 courses. An “A plus” grade at the AP level earns students a 5.0 GPA, a 4.67 GPA in both Level 1 and Level 0 courses and a 4.33 GPA in Level 2 courses. The proposed changes would split high school courses into three categories: Advanced Placement, Honors and College Prep courses. An “A plus” — meaning a score of 97 percent or above — under the new grading scale would give students a 5.33 GPA in AP courses, a 4.83 at the Honors level and a 4.33 at the College Prep level. Though discussion on the subject is still ongoing, the original proposal for grade weight changes, if approved, would affect current freshmen and sophomores at the high schools. This particular point has concerned some parents who are asking if members of the class of 2012 and 2022 could be exempt from the changes. “We will explore the feasibility of grandfathering our current freshmen and sophomores as well,” Ebling said. The board was scheduled to vote on the proposal at their Jan. 15 meeting, but the item was removed from the agenda to give members and administrators more time to deliberate and to get feedback from parents. Parents have also inquired about Level 0 courses, which according to the Program of Studies “focus on conceptual and experiential activities, independent study and readings,” and how they would be categorized within the new grading scheme. Some parents argued students could opt for courses that would ultimately help their GPA instead and forgo opportunities in courses that would allow them to branch out of a purely academic course load. Superintendent Toni Jones said adjustments were still being made to the original proposal, and that the Board of Education was seeking to engage with parents to hear more about their concerns.